Chrome Diopside, also known as Russian Diopside, is a gemstone that hails from the harsh land of Siberia. Due to the harsh climate of its homeland, the stone can only be mined for a portion of the year, when the Earth is willing to give up her yield of this cool green gem. Join us as we uncover the story. The majority of Chrome Diopside is mined in one location: Inagli. 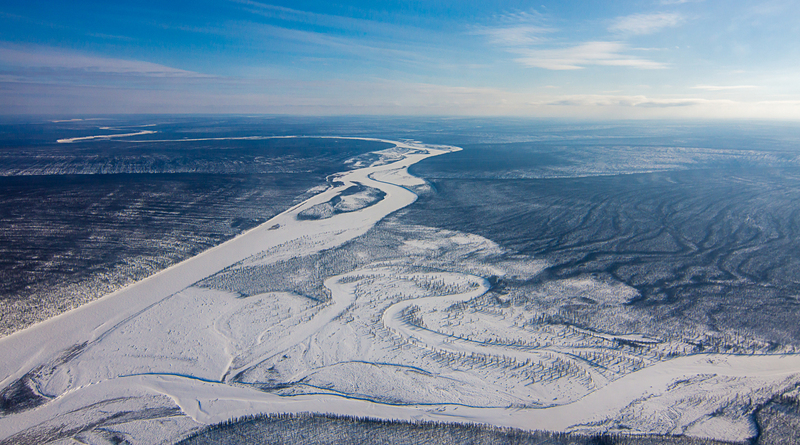 Located in Eastern Siberia, this remote mine locality is squarely placed amid the harsh, rugged terrain of this land. The mine is located about 19 miles west of the city of Aldan. Primarily a gold mining town, smaller deposits such as Chrome Diopside, are also worked by the miners. Overall, the area is afflicted by the typical sub-arctic climate. In the case of this town, however, its proximity to the Pacific Ocean exacerbates some of its weather. The area receives heavier precipitation in the form of rain and snow. Due to the unforgiving climate of the region, production of Russian Diopside can only occur for part of the year. From July through August the weather is mild enough, and the land soft enough, for diggers to excavate the green stone from the bland, cold earth. During the brutally cold winter, the entire area is too cold to mine. Therefore, it is hard to maintain the production levels steady during those seven to eight months. The lowest temperature recorded in Aldan has been −48.7 °C or −55.7 °F on 4 January 1951 and the hottest 35.2 °C or 95.4 °F on 3 August 1969. Rough material is quarried by hand, through open pits. Tools such as jackhammers are employed to break up the tough, unyielding ground. As you can imagine, the work is tough and physically intensive. Chrome Diopside has two planes of cleavage. This means that the stone has two directions on which the material is easily broken. Cutters use it to facet the stone into the shapes we see in jewelry. Due to this, and the need for high-quality gems, only about 10% of rough material finds itself transformed into a polished gemstone. Chrome Diopside is renowned for its brilliant and even green color. There are many varieties of Diopside, but what we know as Russian Diopside receives its color from the presence of chromium. As a mineral, chromium is a shiny and brittle metal. As an impurity within Diopside, it produces the verdant hue that we know and loves. The gems are intensely saturated with color. The color is so rich that the jewel is not often seen in extremely large sizes. Why? Due to the rich color saturation, the color deepens as the gemstone becomes larger. Big stones will have a very dark green to black look about them, making them undesirable for lapidary use in that form. Therefore, it’s rare to find examples over two carats in size. Despite this, it is possible to find gems of up to five carats in size. Due to the gems saturation, and fragile state when cutting, rounded edges are best. Shallow angles help improve the color, and as a result, the most popular shapes tend to be round, oval, cushion and emerald. Round shapes such as round and oval are the most popular, as they provide the best return on rough. Due to its green color, it is often compared to the Emerald. That’s about where the similarities end, though. The hue is typically more pronounced than what’s seen in Emerald. It’s more vibrant and lush. Also, Chrome Diopside has about twice the refractive index. In other words, it has more sparkle! Finally, it’s very rare for Chrome Diopside to be treated. Emerald, on the other hand, often undergoes treatment to reduce inclusions or improve color. With the market demand, it can make finding an Emerald a daunting task. For anyone that loves the color green, or has wanted an Emerald, this gemstone makes a worthy alternative! The green variety of Diopside. Ranks 5.5 – 6.0 on the Mohs scale of hardness. Primarily sourced from Inagli, Eastern Siberia. 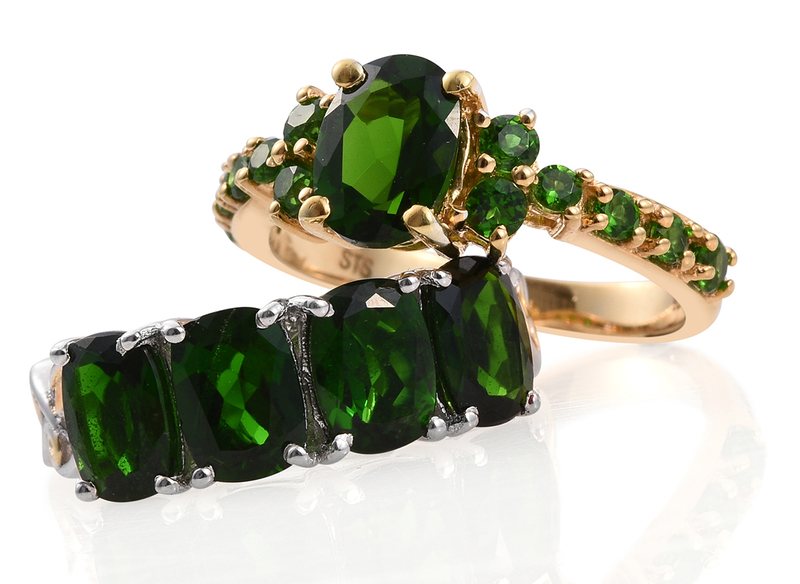 Chrome Diopside gets its name from two elements. Chrome comes from the mineral chromium, speaking to the mineral that provides its color. Diopside is derived from Greek, and the name translates as “two faces.” This refers to the two planes of cleavage within the stone. Russian Diopside first entered the market in the late ‘80s. After the collapse of the USSR, the gemstone began to circulate in the trade more heavily. It quickly became considered a suitable substitute to pricier green gems, such as Emerald and Tsavorite. The limited mining season results in a limited supply of this stone. Coupled with growing demands, especially in emerging markets such as China, the price of this gemstone is expected to rise. In China, internationally popular jewelry brands such as Sino Jewel (China’s No. 1 Colored Stone Jewelry Brand) and Enzo are promoting diopside jewelry as an alternative to emerald and green tourmaline. As Chrome Diopside continues to gain mainstream acceptance, it’s expected that this gem will become a household name in its own right.